In 2014, Domino’s India sold 120 million pizzas, twice the number of burgers McDonald’s served in the country in the same year. The figures may have changed somewhat since, but India’s prodigious craving for pizza, especially with a generous helping of paneer or chicken tikka, remains unchanged. The man who helped stoke this appetite for the Italian staple is Ajay Kaul. 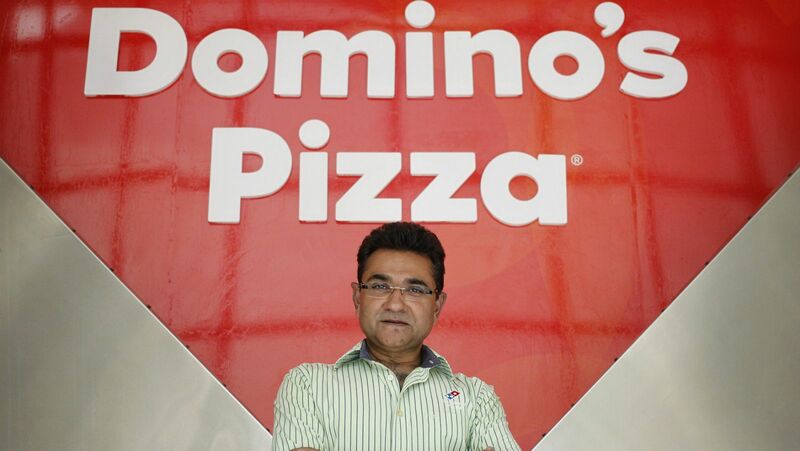 In 2005, 52-year-old Kaul became the chief executive of Jubilant Foodworks, which owns the franchise rights for Domino’s in India, Nepal, Bangladesh, and Sri Lanka. From then on, he expanded the chain from just 93 outlets to over 1,062 stores across the country, making India the largest market outside the US for the American brand. On Sept. 19, after over a decade at the helm, Kaul announced his departure. The precise reasons for the exit aren’t clear; in a statement, the company only said that Kaul wants to “evaluate and pursue opportunities” elsewhere. Kaul’s exit comes after a management rejig at the company was announced earlier this year. Nonetheless, the move comes at a challenging time for Domino’s. The pizza chain is struggling to boost same-store sales (a measure of sales at stores open for at least a year) amid growing competition from stand-alone restaurants. After the news broke, Jubilant’s stock price plunged by over 8% on the Bombay Stock Exchange. Kaul will continue in his current role till March 2017. When Kaul, an Indian Institute of Technology-Delhi alumnus, took over Jubilant Foodworks, Indians had already been introduced to pizzas and burgers, thanks to local chains such as Nirula’s, apart from Domino’s, McDonald’s, and Pizza Hut. But they still weren’t spending big on eating out or ordering in. In the early 2000s, Domino’s was still considered an expensive brand, especially among middle-income consumers. Soon after, Kaul, who attended Xavier School of Management (XLRI) in Jamshedpur in 1989, realised that Domino’s needed to change the game by selling inexpensive pizzas. In a 2006 interview with the DNA newspaper, Kaul said that while Domino’s was well-accepted among the higher-income and upper middle-income groups, its penetration was below satisfaction in the middle and lower-middle strata. That’s why, between 2006 and 2008, Domino’s introduced the Fun-Meal pizza range at Rs. 45, and later the Rs. 35 Pizza Mania campaign that brought the price of a single serving of pizza (i.e for one person) down to less than a dollar. These campaigns “dramatically expanded the pizza category in India,” according to Kaul, outdoing Pizza Hut’s attempts at lowering prices. Indeed, the rock-bottom prices paved the way for Jubilant to expand beyond metro cities to smaller towns like Bhopal, Madurai, and Belgaum. Gradually, it also expanded its India menu, adding cheese-burst pizzas, pastas, and desserts. Kaul, who spent a decade working in logistics firm TNT Indonesia before coming to Jubilant, also bolstered Domino’s delivery service, promoting its “30 minutes or free” campaign. The efforts paid off big time. In 2012, the chain hit 500 outlets across India and has doubled since. Today, Domino’s is much bigger in terms of number stores than McDonald’s or KFC. Pizza Hut, its biggest direct competitor, has only 450 outlets in the country. “While pizza was already part of the fast-food mix, over the last 10 years or so, Domino’s India brought it to the forefront through its systematic and aggressive growth. Ensuring a flavour mix attuned to the Indian palate, penetrating into locations that were not previously serviced, adding dine-in to a brand that essentially had delivery-based DNA, were all part of this growth,” said Devangshu Dutta, CEO at consulting firm Third Eyesight. Kaul also pulled off a successful Rs329-crore initial public offering (IPO) in 2010 and spearheaded the India entry of coffee and donut chain Dunkin' Donuts through franchised rights in 2012. For the year ended March 31, Jubilant Foodworks registered a turnover of Rs. 2,410 crore (US$362.2 million) and a net profit of Rs. 114.56 crore (US$17 million). That’s 33 times more than the Rs. 73 crore (US$11 million) clocked in 2005 when Kaul took over. With Kaul’s impending exit, though, Domino’s finds itself in a spot of bother. Fast-food chains have been struggling lately as competition from newer brands and a general gloom in consumer sentiment hinder growth. Analysts reckon that the company will need solid leadership in an environment where the fast-food model is undergoing transition.